Through audits, energy use education, technical support and energy-management programs, we help learning institutions achieve greater energy efficiency. Our efforts improve learning environments and ease budget pressures. 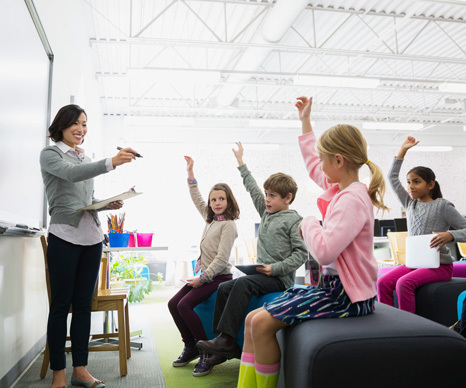 Our proprietary SCORE® program, which pinpoints and maximizes energy saving opportunities at learning facilities, is one of many innovative programs CLEAResult designed specifically for the educational sector. SCORE works to boost savings, improve environmental conditions, meet tailored program design needs and align with regulatory requirements. Working within communities, we collaborate with a diverse group of stakeholders, including utility representatives, school superintendents, facilities and maintenance staff, school administrators and teachers, finance professionals, installation contractors and efficiency equipment vendors. Our experience working with educational institutions allows us to offer proven services, including remote data analysis, energy efficiency benchmarking, marketing support and much more. These programs enable schools to improve the comfort, health and safety of classrooms and other school environments. By lowering energy bills, we also help educational institutions spend less money on energy. Those institutions can redirect that money to other budgetary needs that directly impact student learning, like textbooks and teachers’ salaries. "Thank you so much from Ranchwood Elementary School! It is so bright and such a better environment. I usually go home with my eyes hurting and a headache, but today is the first day that I feel great."